Achieve that wooden picnic table look and feel good about it knowing that it is made with recycled plastic Resinwood slats. 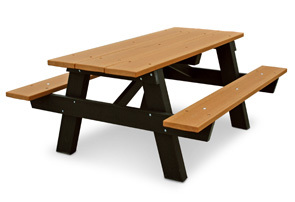 This picnic table will blend well into any traditional environment and is extremely durable. ADA approved model is designed with two overhanging sides for universal access measuring 12" each. ADA table top measures 9 ft. in length. Available in colors shown below. All wheelchair access rectangle picnic tables conform to latest ADA specifications.